Selecta 1-Pole Utility & heavy-duty toggle switch has voltage rating of 120/250-Volt AC and current rating of 10-Amps at 125-Volts/15-Amps at 250-Volts. SPST Switch with screw connection, has plastic body and brass/nickel actuator. It has maximum load capacity of 3/4 hp at 125-250-Volt AC. It measures 1.134-Inch x 0.634-Inch. 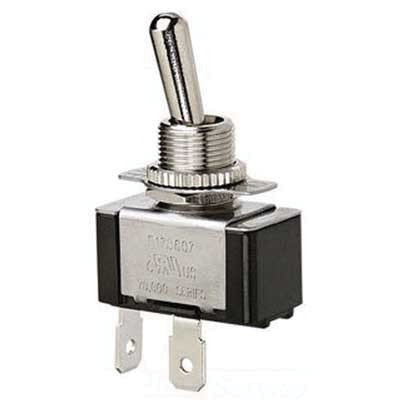 Toggle switch is RoHS compliant.